The Florida Marlins have fired manager Fredi Gonzalez and two coaches. Edwin Rodriguez, manager at Triple A New Orleans, has been named interim manager. Loria said before the season he had high expectations for the Marlins, who improved to 34-36 with Tuesday night’s victory against the Orioles and are in fourth place in the National League East. Also let go were hitting coach Jim Presley and bench coach Carlos Tosca. “We still have a long season in front of us, and plenty of time to turn things around,” Loria said. The Marlins have been burdened by a poor bullpen and slow starts by two of their top hitters, Hanley Ramirez and Chris Coghlan. Defensively, they continue to rank among the worst fielding teams in the majors. 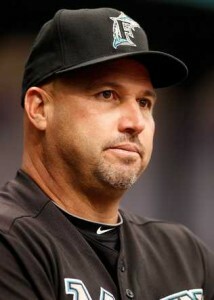 Gonzalez took over as Marlins manager in 2007 when Joe Girardi was fired after one season. Gonzalez has a record of 276-279 with the Marlins and finished with winning records in 2008 and 2009. He won more games than any manager in Marlins history, including World Series winners Jack McKeon and Jim Leyland. The Marlins has an owner that till only recently, avoided paying out big bucks for talent. Nevertheless Loria has expected miracles from his managers, and mediocrity or insubordination(Joe Girardi) won’t be tolerated. I thought the firing of Girardi was dumb. As for mediocrity, what can be expected from a team on a limited budget that always has to pin its hopes on some untried prospect? World Series Rings IMHO can’t be expected under those circumstances. Before today’s firing, Gonzalez was threatening the record for the longest tenure as Florida Marlin manager. The odd thing is, Gonzalez has managed the most games as Marlins manager. What Florida skipper had a longer tenure but managed a smaller amount of games? The answer is beneath the fold. 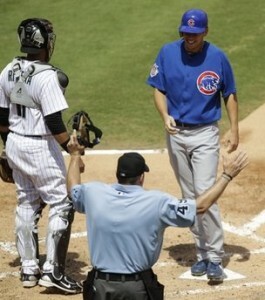 All that said, Gonzalez has never impressed me as an in game manager. Last week’s lineup snafu is just one of many blunders Gonzalez made during his tenure. The Marlins needed a skipper who can manage and Gonzalez I’m sorry to say, wasn’t the person for the job. Rene Lachemanm, the Marlins first manager, led the team for 3.5 seasons before being fired in July 1996. If not for the strike shortened 1994 season, Lachemann would have managed slightly more Marlins games than Gonzalez. Two days after pledging to raise payroll, the Marlins locked up pitcher Josh Johnson to a long-term deal, reaching agreement on a four-year contract that pays $39 million. The deal was confirmed Thursday by the pitcher’s agent, Matt Sosnick. Johnson is the first Marlins pitcher to have a long-term contract since Jeffrey Loria took over as owner in 2002. The Marlins are buying out Johnson’s final two years of arbitration and also securing his first two years of free agency. The year-by-year breakdown for Johnson’s contract: $3.75 million in 2010, $7.75 million in 2011, $13.75 million in 2012 and $13.75 million in 2013. Johnson, who turns 26 on Jan. 31, was the team’s fourth-round draft pick in 2002 and quickly rose through the minor-league ranks before making his debut in ’05. But he sustained an arm injury toward the end of the 2006 season, and after an unsuccessful comeback bid the following year, underwent elbow ligament replacement surgery on his pitching arm. Johnson made his way back toward the end of the ’08 season, going 7-1, and confirmed his status as one of the league’s elite pitchers last season when he started the first half of the year with an 8-2 record and a 2.74 ERA. He also earned his first All-Star team selection. 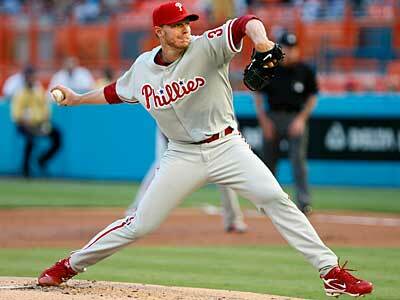 While Johnson pitched very well the last two years, one has to remember he had Tommy John surgery in 2007. He’s 26, and pitchers of that age who undergo serious arm surgery have a greater risk of recurrence. As for the big deal the Marlins made, they could still try to trade Johnson before those hefty payments have to be made in 2011, 12, and 13. I wouldn’t designate the Johnson signing as a permanent change of team policy quite yet. The perennially frugal Florida Marlins have reached an agreement with the players’ union to increase spending in the wake of complaints the team payroll has been so small as to violate baseball’s revenue sharing provisions. The deal was announced Tuesday in a joint statement by the Marlins, the union and Major League Baseball. The parties did not comment beyond the statement, and it was unclear how much the Marlins’ payroll might increase. The agreement runs through 2012, when the Marlins’ new ballpark is scheduled to open. “In response to our concerns that revenue sharing proceeds have not been used as required, the Marlins have assured the union and the commissioner’s office that they plan to use such proceeds to increase player payroll annually as they move toward the opening of their new ballpark,” said Michael Weiner, executive director of the players’ association. Mediation will be used in case there is any future disagreements. The Marlins current payroll is 37 million. How much is team owner Jeffrey Loira willing to increase it? I’d really be surprised at any figure more than ten percent. The Marlins have been run on a shoestring since 1998, and the only way I see any real change occurring is if and when the team gets a new owner. The Marlins are supposed to move into a new stadium in 2012, but I would bet the Loira remains thrifty after it opens. Relief pitcher Luis Ayala was unharmed during an apparent attempted kidnapping by gunmen at his home in the northern Mexico state of Sinaloa. Martin Robles, a spokesman for the state prosecutors’ office, said investigators believed Ayala was the intended victim, whom police prevented from being abducted. Robles said gunmen in three vehicles forced their way into Ayala’s home near the city of Los Mochis on Monday by shooting open the door. Police arrived at the scene after receiving a call to an emergency number, and soldiers dispatched to the scene apparently scared off the assailants. Ayala’s family was unhurt but police found him in handcuffs when they arrived. With the drug related violent crime rampant there at the moment, Mexico might be the last country in this hemisphere I’d want to visit.